We have just released our new pro joomla 2.5 template with slideshow: a4joomla-Darksunset, a new cross-browser compatible, customizable, professional joomla template with 13 module positions, 5 color schemes: aqua, black, green, blue and purple, tableless portal or blog layout, dropdown menu and built-in slideshow. 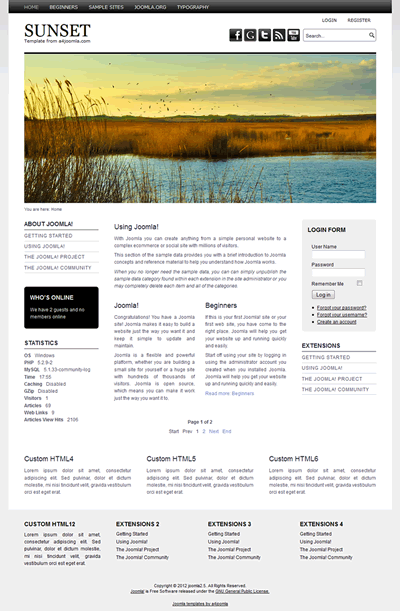 A free version of this joomla template is also available in black scheme. 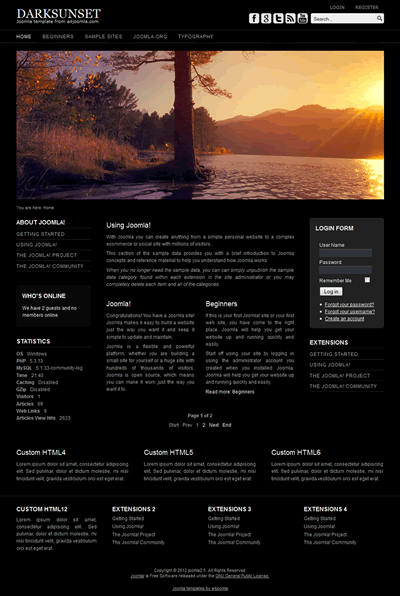 The commercial a4joomla-Darksunset joomla 2.5 template can be purchased here. We have just released our new free joomla 2.5 template with slideshow: a4joomla-Darksunset-free, a new cross-browser compatible, customizable, free joomla template with 6 module positions, black color scheme, tableless portal layout, and built-in slideshow. 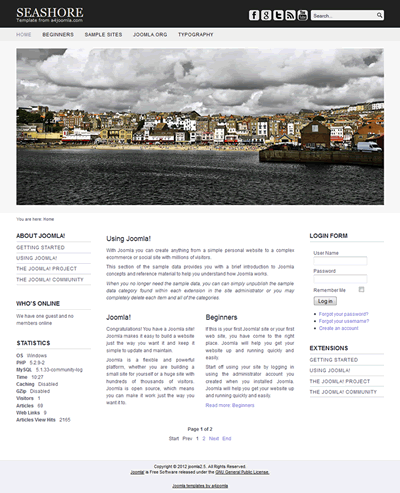 The commercial version of this joomla 2.5 template can be purchased here. 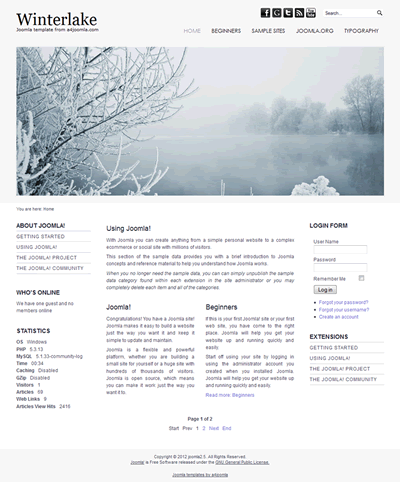 We have just released our new pro joomla 2.5 template with slideshow: a4joomla-Winterlake, a new cross-browser compatible, customizable, professional joomla template with 13 module positions, 5 color schemes: aqua, grey, green, blue and purple, tableless portal or blog layout, dropdown menu and built-in slideshow. 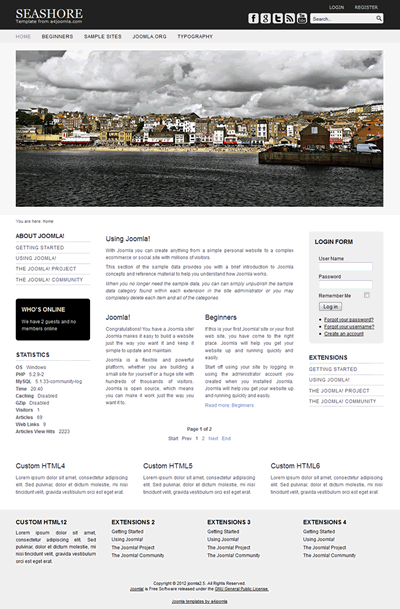 A free version of this joomla template is also available in grey scheme. 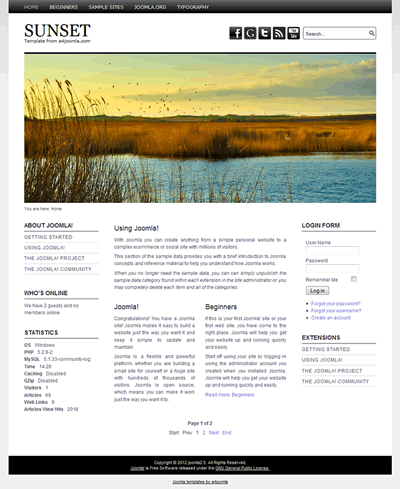 The commercial a4joomla-Winterlake joomla 2.5 template can be purchased here. We have just released our new free joomla 2.5 template with slideshow: a4joomla-Winterlake-free, a new cross-browser compatible, customizable, free joomla template with 6 module positions, grey color scheme, tableless portal layout, and built-in slideshow. We have just released our new pro joomla 2.5 template with slideshow: a4joomla-Ocean, a new cross-browser compatible, customizable, professional joomla template with 13 module positions, 5 color schemes: aqua, grey, green, blue and purple, tableless portal or blog layout, dropdown menu and built-in slideshow. A free version of this joomla template is also available in blue scheme. 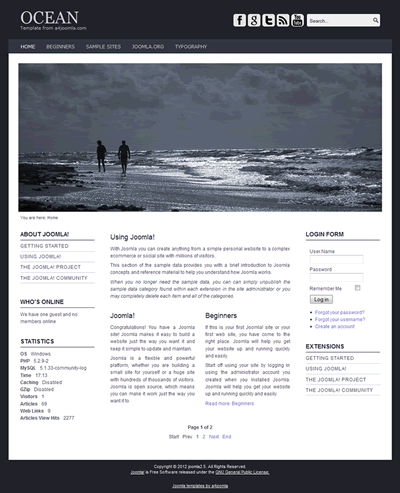 The commercial a4joomla-Ocean joomla 2.5 template can be purchased here. We have just released our new free joomla 2.5 template with slideshow: a4joomla-Ocean-free, a new cross-browser compatible, customizable, free joomla template with 6 module positions, blue color scheme, tableless portal layout, and built-in slideshow. We have just released our new pro joomla 2.5 template with slideshow: a4joomla-Seashore, a new cross-browser compatible, customizable, professional joomla template with 13 module positions, 5 color schemes: aqua, light grey, green, dark grey and purple, tableless portal or blog layout, dropdown menu and built-in slideshow. A free version of this joomla template is also available in light grey color scheme. 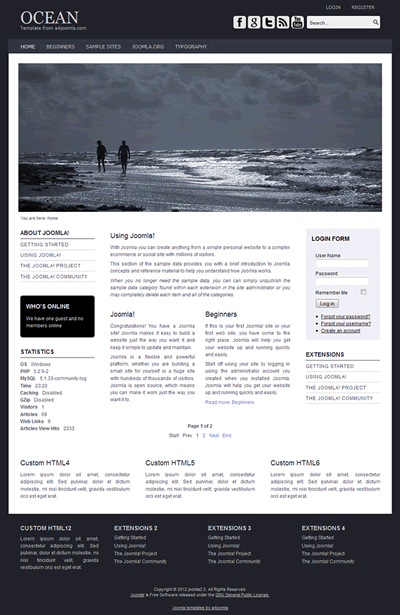 The commercial a4joomla-Seashore joomla 2.5 template can be purchased here. We have just released our new free joomla 2.5 template with slideshow: a4joomla-Seashore-free, a new cross-browser compatible, customizable, free joomla template with 6 module positions, grey color scheme, tableless portal layout, and built-in slideshow. We have just released our new pro joomla 2.5 template with slideshow: a4joomla-Sunset, a new cross-browser compatible, customizable, professional joomla template with 13 module positions, 5 color schemes: aqua, grey, green, blue and purple, tableless portal or blog layout, dropdown menu and built-in slideshow. 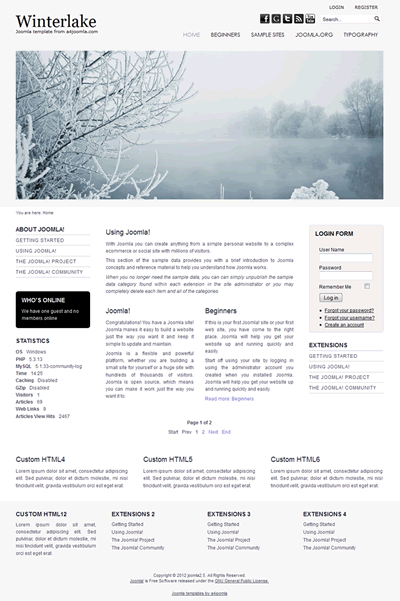 A free version of this joomla template is also available in grey color scheme. 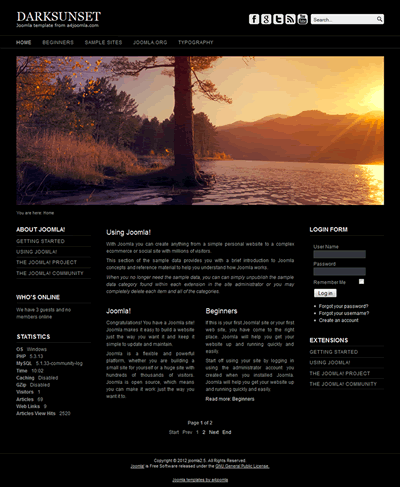 The commercial a4joomla-Sunset joomla 2.5 template can be purchased here. We have just released our new free joomla 2.5 template with slideshow: a4joomla-Sunset-free, a new cross-browser compatible, customizable, free joomla template with 6 module positions, grey color scheme, tableless portal layout, and built-in slideshow.